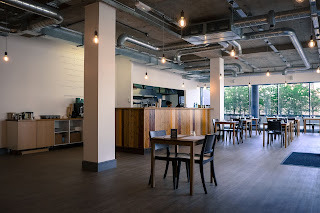 Another week, and another gaping hole in Newcastle’s food scene is plugged, this time by a modest new restaurant run by people who really deserve our custom. There have always been plenty of places to get bowls of pasta in town, but many of them come accompanied by The Godfather theme and illuminated by flickering tricolour candles stuffed into empty chianti bottles. 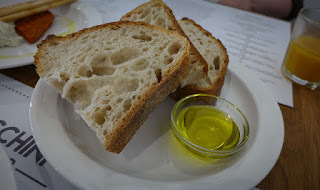 There’s a time and a place for that sort of thing - birthday meals in the 1980’s, mostly - but for those of us who prefer our carbs served with a little less cliché, I bring good news. 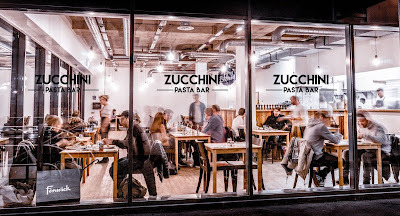 Newcastle now has its own fresh pasta bar. I had been inside this bit of the Swan House roundabout once before. It was then the City Retreat spa and I popped in to grab some gift vouchers for Mrs Diner. I don’t recall what I was apologising for. I vaguely remember it being a bit pokey and dark, but no longer. Now, as Zucchini Pasta Bar, the whole place has been opened up and given a lick of whitewash to create a pleasant airy room. Before the main event, a word about the sides. At a mere two quid each, they’re worth a thorough investigation. A generous plate of olives were of the ubiquitous nocellara type, neat little orbs of emerald salinity. 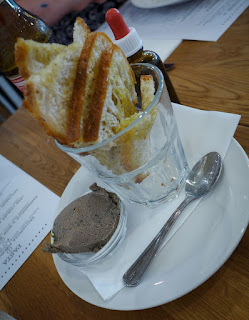 Crisp wisps of crostini were an admirable vehicle for a decent chicken liver pâté. 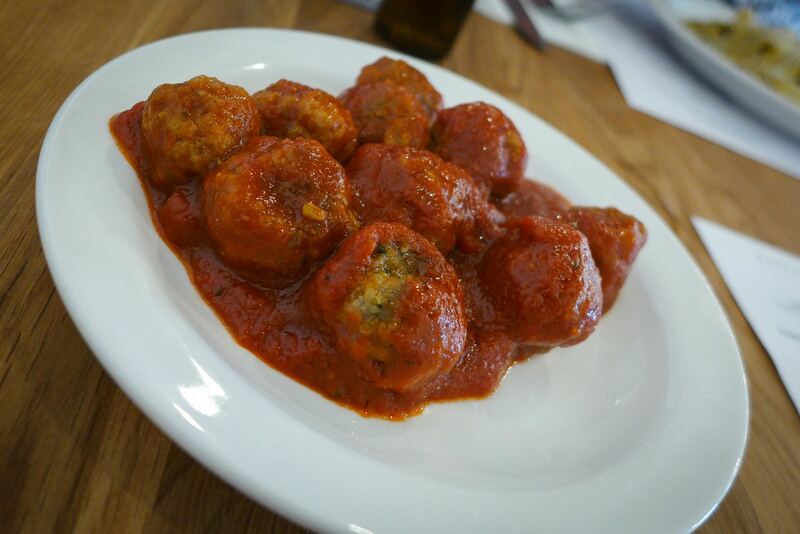 Pork meatballs, juicy and well seasoned, were lifted by more fennel seed and napped with simple but delicious tomato sauce. “Better than Ikea’s,” said the friend who was accompanying me. This was meant to be a compliment. 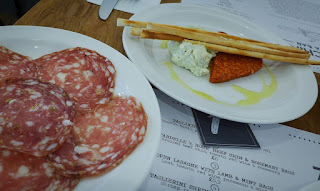 A plate of finocchiona - a Tuscan salami, singing with fennel - was lovely, full of ripe funk. Best of the lot was a plate of creamed gorgonzola and nduja, that fiery Calabrian spreadable sausage that tastes like chorizo wishes it could but doesn’t have the courage. These two huge umami-bomb flavours worked together just fine, with skinny breadsticks to eat them with. The only minor dud was the sourdough, which although admirably made on-site, tasted like it may have been a day old. 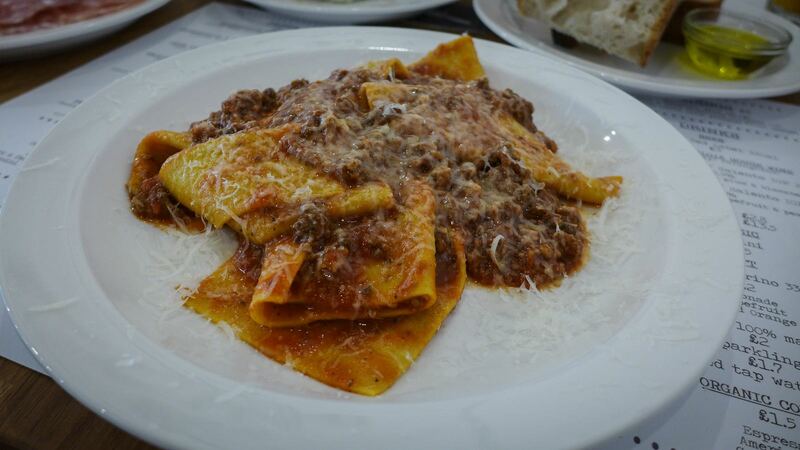 However, it’s the home-made fresh egg pasta that’s the star here. It is light yet substantial, perfectly al dente, a fine tribute to the misunderstood and underappreciated wonder that is gluten. 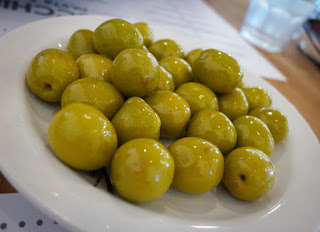 Each of the various formats in which it came, and sauces that accompanied it, were locatable on a scale that ran from pleasant to downright lovely. A meltingly rich beef shin and rosemary ragu was a real winner, poking suggestively out from between folds of pert pappardelle. The same cut of pasta was also enjoyable with an amatriciana sauce that featured guanciale, one of the best things humans have so far found that you can do with a pig’s head. 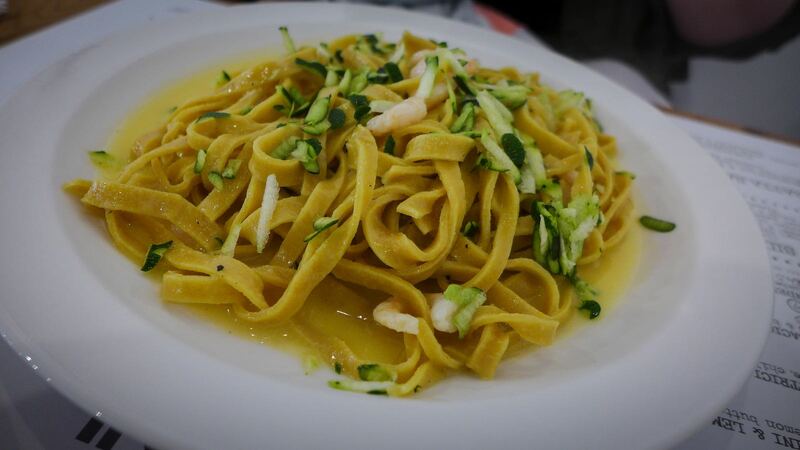 A summery sauce of shrimp, raw zucchini, lemon and butter was perfectly emulsified. I could have sworn it was given a leg-up by a healthy dose of anchovy, although our waiter assured us otherwise. 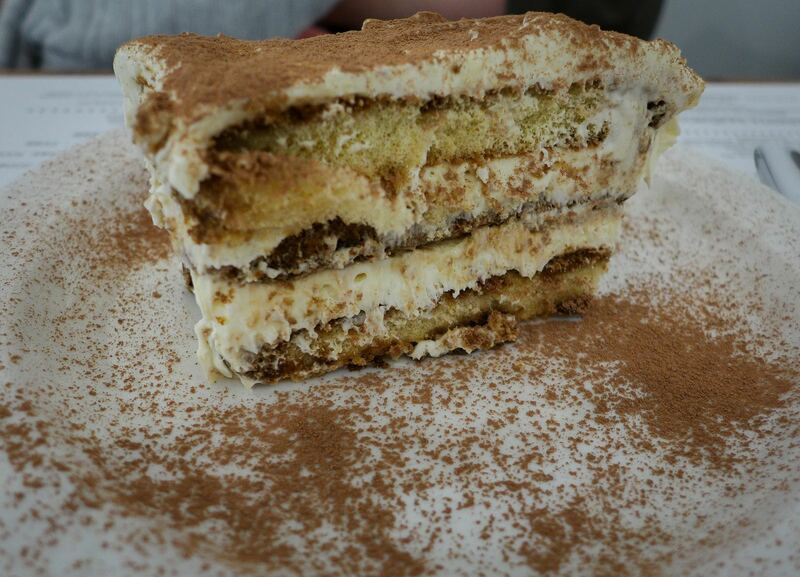 Either way, it was a fine partner for more good pasta, taglierini this time. Cacio e pepe (“cheese and pepper” sounds so much better in Italian, don’t you think?) is one of Rome’s staple dishes, and one whose tangy, slurpy sauce demands spaghetti or tonnarelli. 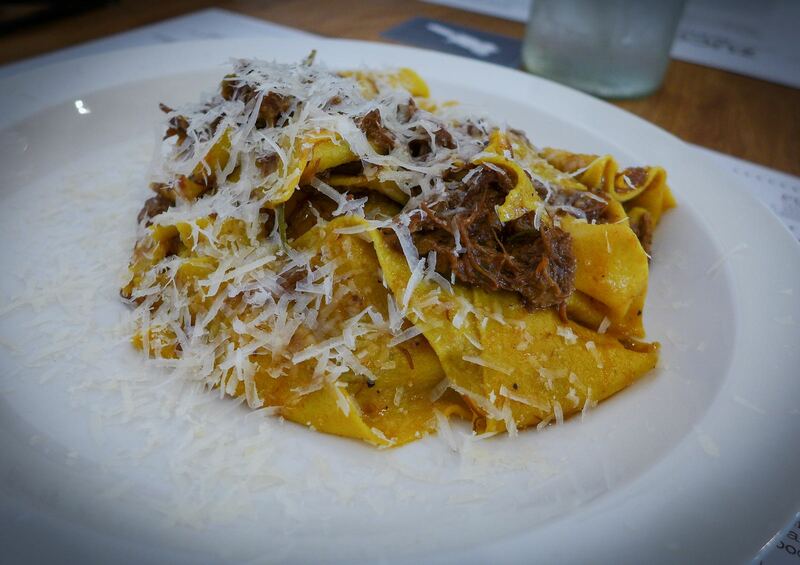 However, here they served it with tagliatelle. This, in my not so humble opinion, is plain wrong. And herein lies the one slight problem I have with Zucchini. I know it sounds churlish to criticise a fresh pasta bar for not serving dried pasta, but many Italian sauces actually work better with dried. There’s a kind of pasta snobbery in Britain today, whereby people think that the opposite of fresh is somehow – well, not fresh, and therefore inferior. I guess that’s why so many people choose to buy those terrible packets of “fresh” pasta in supermarkets, which taste of nothing at all, rather than invest in good quality dried egg pasta, which is invariably superior. Many restaurants don’t like the dried, because it’s a pain to cook (unless, horror, it’s parboiled), but dried egg pasta has bite, and the long cooking time generates starchy water that should be part of the dish. 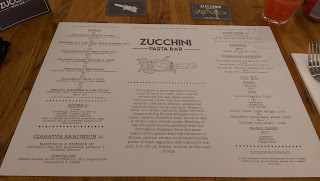 Zucchini’s cacio e pepe, apart from spaghetti, also could have done with more cacio e pepe. Aside from that, it was pleasant enough. 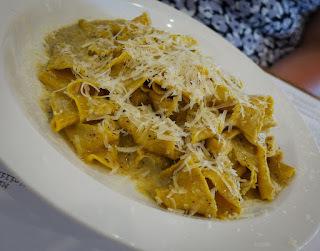 The average price of these pasta dishes, all of which are served in portions that would make an excellent work lunch, is about a fiver, which is stonking good value. Puddings were a bit hit and miss. Tiramisu was good, a blowsy great cloud of cream and slightly boozy sponge that could have been boozier. 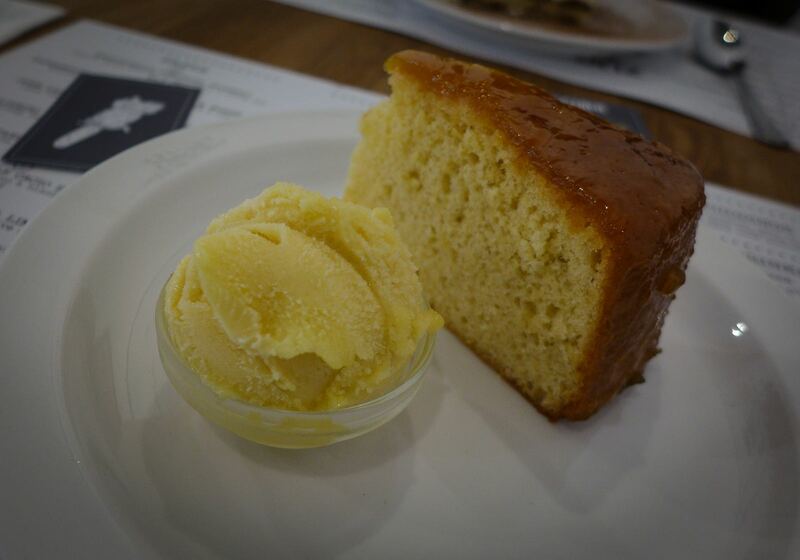 A Sicilian lemon sponge had good flavour but was a rather tight and dry. Service was super-friendly. There’s a good range of soft drinks available, alongside Peroni and one each of red and white wine. I do hope that the slightly remote location doesn’t count against Zucchini in the long term. I went twice, and on both occasions we had the place to ourselves, although I was assured they had been busier at lunchtime. Being plonked in the middle of a roundabout, tucked out of sight from most of Pilgrim Street isn’t the most obvious place for a restaurant. Hopefully enough people will clock Zucchini and check it out. I certainly hope so. On the walk back to the motor, we passed through Grey’s Quarter, where ASK Italian was doing a brisk trade. Out of interest, I checked the menu. Four fresh egg pastas were between two and three times the price of those available at Zucchini, where they’re cooked by an experienced chef, Alan Barker, who has taken the considerable risk of opening his own place. He deserves our support.